Growing up in the 1970s and '80s, I remember these commercials and the distinct scent of Bain de Soleil. The other day I searched Drugstore.com for the famous, island scented orange gelle and was surprised to learn the product is still available. However, now that we're Florida residents an SPF of 4 and 6 won't cut it. The dark tanning product maxes out at SPF 10. Does anyone remember the Bain de Soleil commercials? Watch and relive the magic of the Bain de Soleil jingle I so loved singing every time my folks took us to the beach. Or was that "Quick Tan?" I haven't heard of this before but that guy narrating was a little creepy! Now you will have to use the sport block spf 50! My parents live near Miami, maybe if you are on the way we can visit sometime! I will bring the cookies! I love all these blasts from the past that you give me & make me remember all of those things forgotten!! yessssss, i remember these commercials and a friend of mine uses it every summer. she never actually goes out in the sun- it's really more to feel like she's living on the french riviera. That was way before my time. I vaguely remember hearing about this brand, however, I have always been far to pasty to even wear an SPF 4 while in a conference room with florescent lights. So I never tried the stuff out. But they failed to tell those of us with white skin and freckles that a terrible burn does not give birth to a St. Tropez tan. I TOTALLY remember these commercials and remember that I too wanted the deep dark tropical tan! As a guy, it seemed we tanned easier than girls - or at least we didn't have to try as hard. I remember that we would just smear baby oil on us and go outside for whole weekends at a time. You sure don't see many (any) tanning commercials nowadays! Thankfully, I do not remember this product. 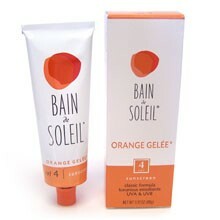 I totally remember Bain de Soliel orange gelee. It and Coppertone were the scents of my childhood summers :). Yes! I remember this and also still remember the song! Sadly, when my own tan never looked like that of the beautiful model in the commercials...and the orange gelee stuff, which I last used in 2000, stained my clothes.